Calculus is one of the milestones of Western thought. Building on ideas of Archimedes, Fermat, Newton, Leibniz, Cauchy, and many others, the calculus is arguably the cornerstone of modern science. Any well-educated person should at least be acquainted with the ideas of calculus, and a scientifically literateperson must know calculus solidly. 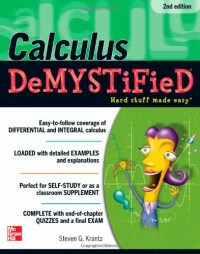 Calculus has two main aspects: differential calculus and integral calculus. Differential calculus concerns itself with rates of change. Various types of change, both mathematical and physical, are described by a mathematical quantity called the derivative. Integral calculus is concerned with a generalized type of addition, or amalgamation, of quantities. Many kinds of summation, both mathematical and physical, are described by a mathematical quantity called the integral. What makes the subject of calculus truly powerful and seminal is the Fundamental Theorem of Calculus, which shows how an integral may be calculated by using the theory of the derivative. The Fundamental Theorem enables a number of important conceptual breakthroughs and calculational techniques. It makes the subject of differential equations possible (in the sense that it gives us ways to solve these equations). security architecture. Firewalls are the core component of your network’s security.